We took a 20 minute flight from St Barts and landed safely in Anguilla. Our plane was late, and since we only had 2 nights in Anguilla, we went straight from the airport to looking at villas with one of our island managers. 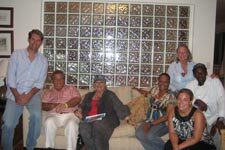 For transportation, Wendell Connors is Wimco's favorite taxi service in Anguilla and Wendell himself took us around to all of our villas in a huge, air-conditioned van while giving us all of the latest island gossip and news. Anguilla was quite the culture shock coming from St Barts. The main roads were bigger and less of a roller coaster ride, however, Anguilla is part of the British West Indies and driving happens on the other side of the road. Once I got past thinking other cars were going to crash into me, it actually became pretty fun. And although my pathetic high school level French got me through my time in St Barts, it was very refreshing to have everyone speak English on Anguilla.The thing I didn't realize about Anguilla is how long and thin it is; it is approximately 16 miles long and 3 miles wide. The land is very flat and dry and then there are just dozens of white sandy beaches all along the coasts. The capital is The Valley, though I never got the sense of all of the population being concentrated in one area. Everything is pretty spread out throughout the whole island, which is pretty nice because it gets you out and exploring and you really get the entire destination. The villas in Anguilla also aren’t really concentrated in one area either. Most of them are at the end of private dirt roads with ocean views and really feel secluded and relaxing. Our accommodations on Anguilla were truly first class. Our first night was spent at Villa RIC PAR in Blowing Point. It is a 6 bedroom, 5 bath dream house and Lidy and Doug were kind enough to let me have the master bedroom. I had my own huge balcony, amazing bathroom and walk-in closet. I was definitely a very happy camper! Our second night was spent at the world renowned CuisinArt Resort & Spa where we were treated to beautiful suites. The bathrooms there were to die for and I had to try out their fantastic bathtub. Also, only a few steps away from my room was an expansive, gorgeous beach. The sand was like sugar and Doug found the most perfect sand dollar I have ever laid eyes on.I think every hotel is on a beach in Anguilla, so it's quite an added bonus that you don't have to go very far to catch some rays. 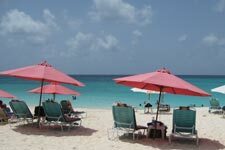 I was sad to blow through Anguilla so quickly because I would have loved to try more restaurants, however, the food we did have was excellent. Our first night dinner was held at Villa RIC PAR and a wonderful private chef came in and made us a whole tasting menu. We feasted on corn soup, crayfish salad with feta and balsamic, snapper fish, crayfish in the shell, lamb with potatoes and beans, and 'apple surprise' for dessert - vanilla ice cream, berries, apples, cinnamon, and a very thin pastry on the bottom. I think that may have been my favorite meal of the whole entire trip! We did our lunches at more casual beach joints – Madeariman Restaurant and the Dune Preserve Restaurant. The Dune Preserve is right next to CuisinArt and it's run by Bankie Banx, a musician and one of Anguilla's biggest celebrities. They have the Moonsplash Music Festival there every year in March and it has a ton of character. I got a nice basic cheeseburger that really hit the spot, but unfortunately just missed the Sunday afternoon Jazz performance they always have. Our last dinner was at CuisinArt's restaurant Santorini. It was very special and I had the delicious sea scallops and foie gras served on potato and leek fondue. 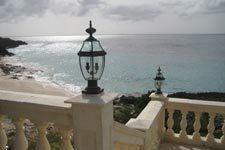 'Impressive' is probably the most accurate word to describe the villas in Anguilla. They have perfected the art of the big, amazing house. These are the types of villas you never need to leave the entire week because they have so much space for you to relax in. Villa RIC SAN in Limestone Bay has a phenomenal outdoor area that includes a covered area with a large grill. It also has one of the biggest master bedrooms I have ever laid eyes on. Villa RIC DES is so thoughtfully done and all of the stone work throughout the house was created by the owner's son. The kitchen is so fully equipped that I can almost guarantee it will have every single thing you can think of – it's ready for a big dinner party or a quiet meal with the family. Villa IDP NIR in North Hill is a 4 bedroom with nice, big beds and a great room on the bottom floor that would be perfect for families traveling with teenagers. There is also a nice gym for those fitness fans who want to keep in shape on vacation. In addition to those villas, we also looked at a couple new villas that will be coming onto the rental market within the next couple of months. They are some really super properties!